The Yorkshire Three Peaks walk is an endurance challenge of 26 miles and which includes approx 5,000-foot (1,524.0 m) of ascent and descent going up and down the mountains of Pen-y-ghent, Whernside and Ingleborough. The aim is complete the challenge in under 12 hours. The Mr and I arrived at the hotel at 10.30pm after a 2 and a half hour drive. Thanks to a full tank of petrol, snacks for the road and a refusal to stop for the loo (the threat of having to use a coke bottle meant that good bladder control was at a premium) it was a straight run up the M6 from Junction 1 to Junction 34. Easy peasy. And arriving late at night meant that I didn’t see the flatness of Warwickshire turn into the peaks of Yorkshire and put the fear of sheep into me. I’d booked the hotel over the phone and had been assured that I could have a lovely breakfast at whatever ridiculously early time I wanted. 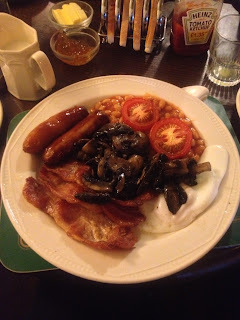 However, our views on what constituted “a lovely breakfast” differed and rather than the massive greasy fry-up I’d hoped for, there was a jug of cold milk and some boxes of cereal. Bother. I made do with cold Weetabix. I’d never had cold Weetabix before and wasn’t sure how to get it to congeal. Weetabix should be hot! Damn you, Weetabix heathens! I DID eye up the rice crispies but it looked as though a child had already beaten me to the free toy and I decided that crispy rice wasn’t worth the risk of a dodgy tummy. On a windy mountain. With lots of hikers. And sparse cover. 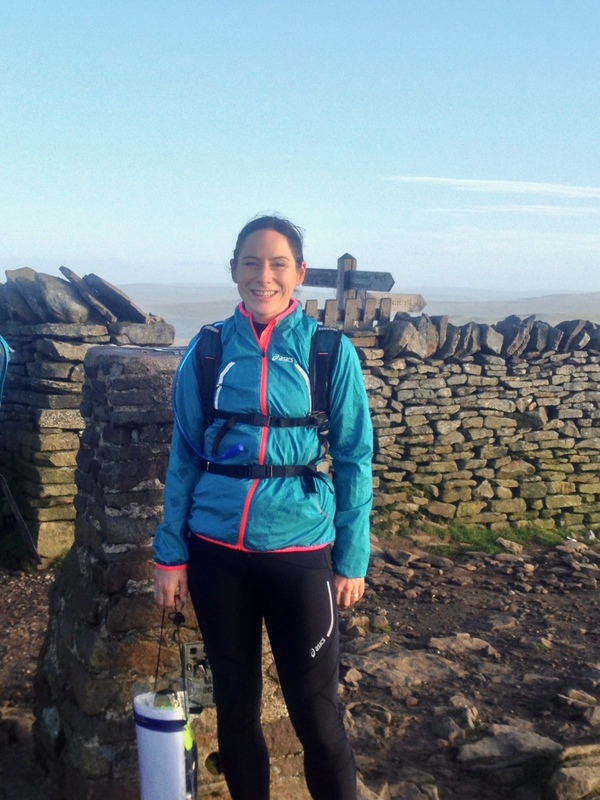 The challenge officially starts at Pen-y-Ghent Cafe in Horton-in-Ribblesdale and there is an ancient clocking-in machine which you can use to record your start and finishing times. 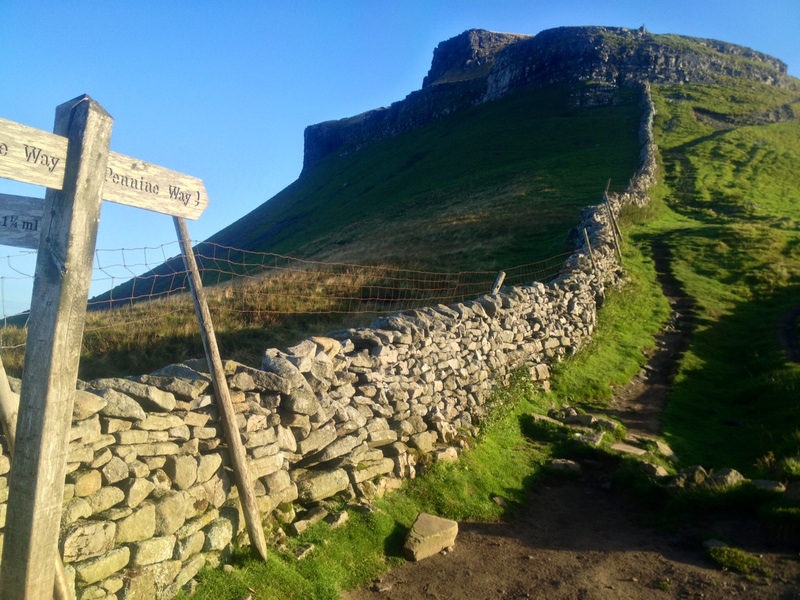 If you complete the circular walk within 12 hours, you’re invited to join the Cafe’s 3 Peaks of Yorkshire club. However, the cafe doesn’t open until 8am so we put a card with our name and information and our start time (6:40am) through the postbox instead. 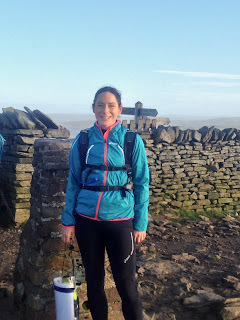 We got sidetracked for 10 minutes taking photos and having photos taken by the Pen-Y-Ghent Cafe signpost, but we set off at around 6:50am. Running rucksack on shoulders, pick’n’mix in hand and map, compass, spare pick’n’mix and chocolate in a map bag around my neck. 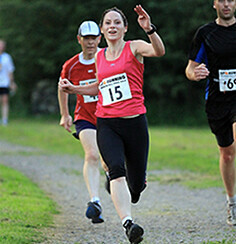 As is tradition at the start of EVERY race or challenge, my treacherous bladder told me that I was desperate for a wee. I ignored it. I’d managed the entire Paris marathon with my bladder whispering “wee, wee, wee!” the whole way round like a chorus of Little Pigs on their way home and I had managed not to cry, stop or wet myself there. 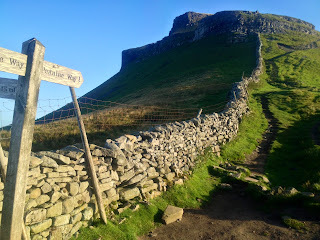 We turned right from the cafe and passing – and ignoring the first signpost to Pen-Y-Ghent - we continued up to the church and took the second lane on the left up past the primary school. The road grew narrower and narrower and steeper and steeper and soon we’d passed all of the houses and into the country where the lane was bordered with dry-stone walls. In fact, the sheep in the field opposite the first stile up to Pen-y-Ghent said “Moooo.” I’d like to confirm that I wasn’t under the influence of anything other than Weetabix. I have seen sheep before and they have definitely said “baaa”. While I do not in any way consider myself an expert on sheep, I have it on good authority (nursery rhymes for instance) that sheep say “Baaa.” COWS say “Moo.” This was a SHEEP. It said MOOO. It concerned me so much that I sidetracked our mission to get The Mr to listen to it and I would like to confirm that he agreed that it said moo. I looked at the sheep suspiciously. It looked back and moo-ed at me. I have my suspicions about that sheep. There was probably a farmer behind the wall, practising his specialist ventriloquist’s act and wetting himself at the confused townies. The climb to Pen-y-Ghent really starts when you cross from the lane into the field over a stile. There are a series of small but steep rolling hills with a dirt path made by the thousands of feet that cross this way. 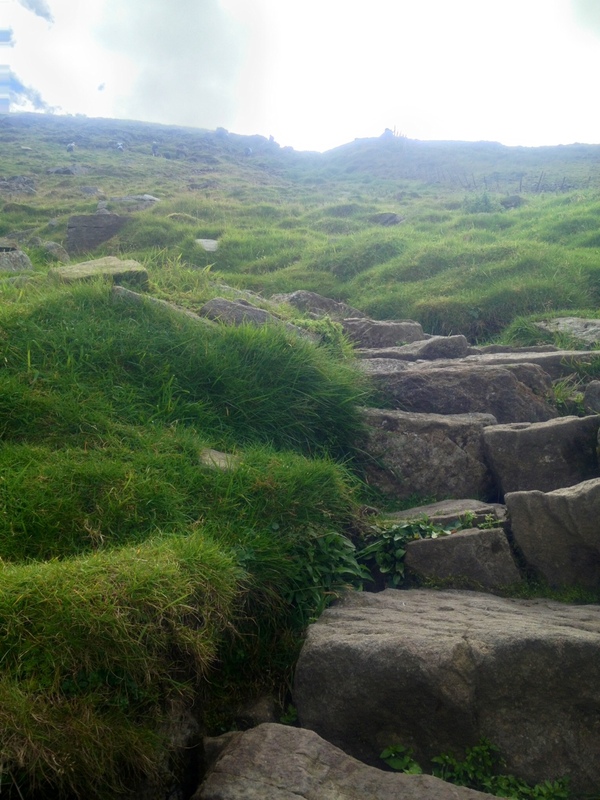 The ways over the dry stone walls are by gaps – for the very slim or those with long legs – or stone steps made by blocks sticking out of the walls or ladder stiles. So the long stretches of walking between mountains are interrupted by the equivalent of walking up to the height of a child’s slide and then walking back down again. On around the third of the steep fields we were overtaken by a fell runner. He was obviously a fell runner. Wearing shorts despite the chill? Check. Ruddy cheeks? Check. Over 65 but still going faster than me? Check. Plus he was running on the fells. Yep. Definitely a fell runner. I wasn’t sure whether to envy him or not. Usually when I see runners I get the ‘I wish I was going for a run” feeling but considering we were climbing a very steep hill and my heart rate was maxed out just walking up it, I wasn’t entirely convinced that I could manage any other speed faster than ‘shuffle’. I don’t think there’s a race category for ‘Fell Shufflers’. 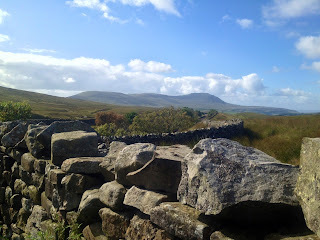 As we got to the last of the fields, we climbed over a stone wall and the path took a sharp turn to the left. The first mountain of the three towered above us. It was bright sunshine and there was an autumn tang in the air but it looked sleepy and peaceful. Quite unlike how I know it can be, with snow drifts, howling winds and ice. It looked a pleasant climb in the sunshine but I wasn’t planning on underestimating how dangerous these mountains can be. The body of a lady had been discovered near here a few years ago and she has never been identified which seems so sad. Someone, somewhere must be missing her. This mountain is one of the most fun to climb especially in the sunshine. 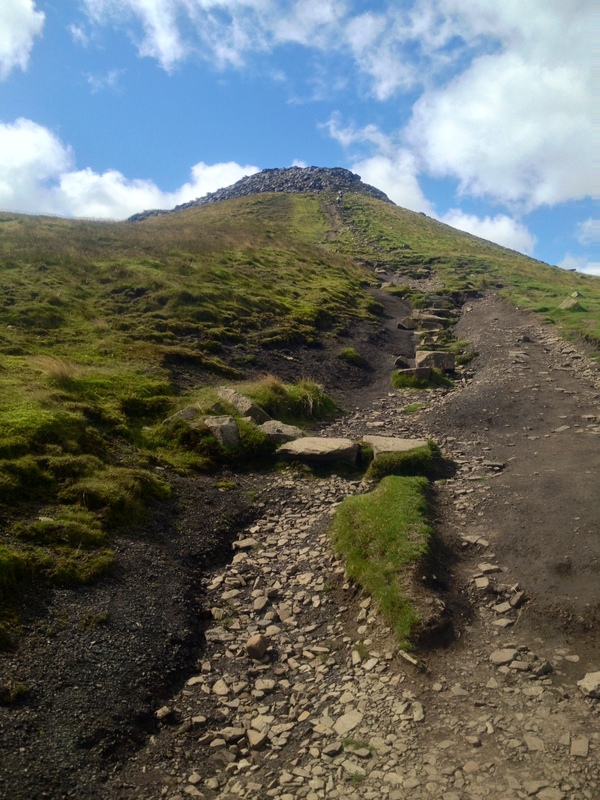 It’s steep in a rocky way and there’s a sharp scramble to the top. 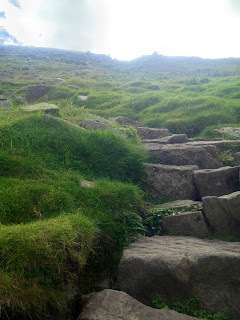 The path leading up is made of slabs and steps but it’s proper hands and knees climbing. We got to the top and the trig point. 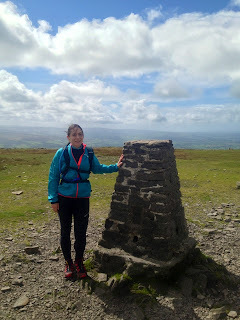 Well near the trig point. A group of women decked out in full winter climbing gear, but with perfect makeup and hair were having the equivalent of a photo shoot in front of it. After us waiting for 10 minutes to get a snapshot, they finally moved slightly to one side, thus ensuring that while their photos might be done, they wanted to ruin anyone else’s if they got the chance. I resisted the urge to wee on their sandwiches and we set off towards the next mountain. Now for the fun bit ... running the down hills! We’d decided to travel light today so had the obligatory map and compass and first aid kit, money, spare shoelaces, torch, snacks and camelback but that was it! It sounds a lot but that all fitted into a very lightweight camelback and running belt. We passed a lot of people with great big rucksacks. Absolutely no idea what they had in them – they didn’t seem to contain sleeping bags and tents. Maybe they thought they’d get stranded and very hungry and didn’t fancy chasing mooing woolly beasts for food. The Mr and I were more practical. We’d never catch a sheep if we got lost. They’re just too quick. We’d eat a hiker instead. One with a big rucksack on and perfect hair. Particularly if they’d just ruined our trig point pictures. We ran down the mountain. The paths were very good apart from occasional loose stones and I got overtaken by The Mr. As he ran past his voice drifted back... "I'm like a gazelle ...” (Then the noise of a stumble reached me and a muffled swear) “...On roller skates!!" 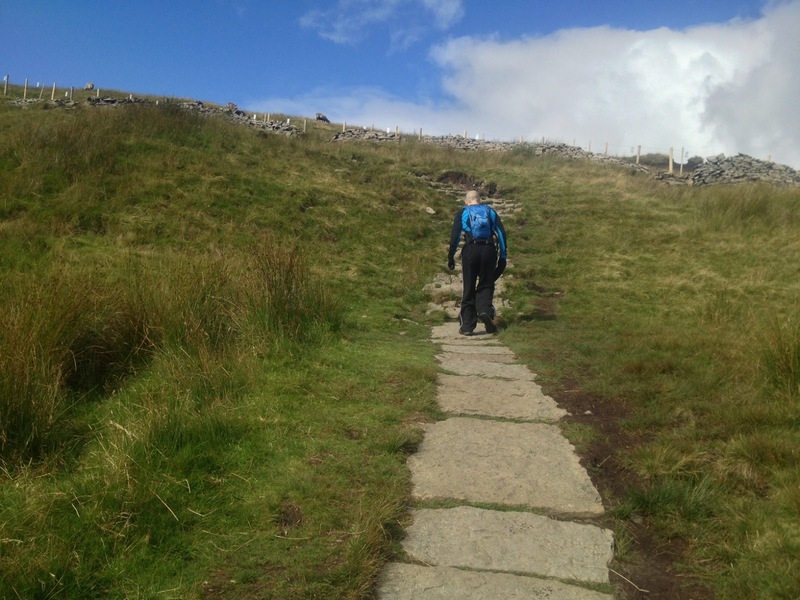 At the bottom of Pen-y-Ghent, the paths were gravelled and well maintained and there were signposts and the route was well marked. Very different to how it had been when I’d walked the route 3 years ago. I’d been telling stories of The Bog and had even invested in some Seal Skinz waterproof socks after falling into the bog last time and having to walk the remaining 20 miles, brown to the knees and smelling as though I’d been paddling in a portaloo. However, The Bog never appeared! The paths avoided the area and there was no sign even of where it had been. There weren’t even any slightly damp areas - the streams had been bridged and squelchy areas gravelled. The walk between Pen-Y-Ghent and Whernside is long and fairly flat. Well flat compared to the mountainous bits. Without the threat of the Bog of Doom, it was uneventful except for the sheep and the occasional stile. The area is beautiful and in the sunshine it was lovely to walk. The birds sang and the sheep baaa-ed (and mooo-ed) and apart from the occasional warning not to tread in the dead rabbit on the path it was perfect. There’s a turning off the stony trail which leads you over a stream and down some grassy hills and following the path brings you to a fork in the trail. One way tells you to “fasen the gate” (sic) and leads over a wall with a gate at the top. The other path leads you over a wooden footbridge over a stream. Checked the map. Checked the instructions. The instructions are clear about heading over the field towards the farmhouse and not going over the bridge. Got to the farmhouse gate and was confronted by a big sign with ‘no public right of way’ written clearly on it. Hmmm. Saw another footpath sign and stile but the path was blocked by lots of tree branches. This doesn’t seem right. Quick Sarah – look as though you know where you’re going. It was getting difficult to maintain my I-know-Where-I’m-Going face wading through knee high grass though. Gave up and asked a farmer. Waded back through the knee high grass. And walked over the wooden bridge with the 3 Peaks sign on it. Through more fields and over an iron bridge, sturdy and massive. Our footsteps echoed as we walked over it. Seemed strange to have it here on this tiny track. Wondered if there was a troll living underneath it as our footsteps trip-trap, trip-trapped across it. 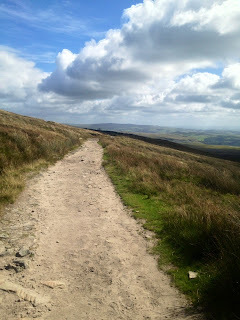 The path was fairly clear now, mud, gravel or stone tracks winding through fields and between hills. Mile after mile of rolling green hills, streams and sheep. There are haunted sheep in those hills. I stopped to check the map and looked up and I was surrounded by sheep. 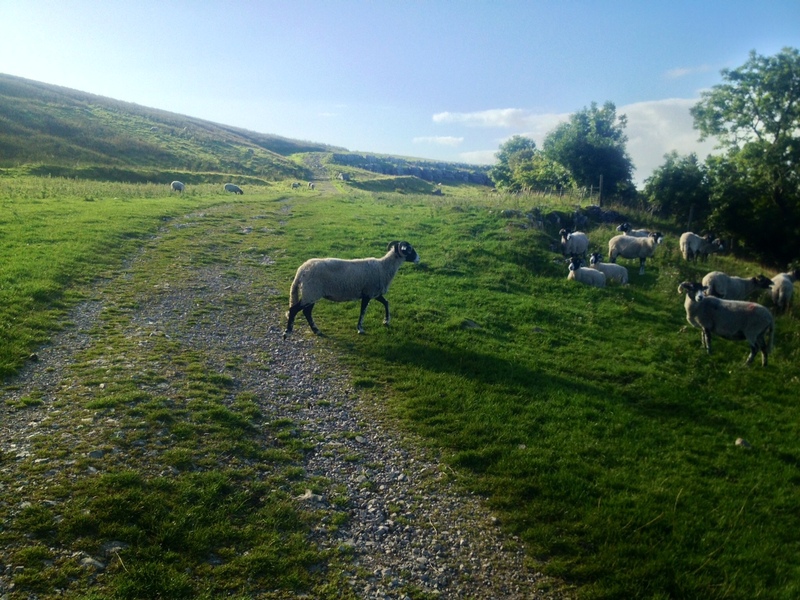 They baaa-ed at me in deep, resonant voices that sounded strangely human. I had found a sheep that moo-ed earlier and now I was surrounded by animals that bleated in the voices of old men. We’d kept walking and hadn’t stopped but when we spotted the coffee van just before the Ribblehead Viaduct, we decided a hot cup of coffee was in order. The cafe owner was a miserable old woman who had obviously decided long ago that she had an uninterrupted revenue stream from all of the walkers and therefore didn’t need to be nice to any of them. Although I don’t want to be unfair. Maybe she was just allergic to gaiters, rucksacks and woolly socks and was suffering pangs of jealousy at the natty attire of all of the sweaty, muddy walkers. Drank our coffee and all of a sudden Spiderman sprinted across the road. The Mr leapt up and bellowed “Can't be beaten by Spiderman!” And took off after him. I watched in puzzlement and ran after him to find a bemused man (who was raising money by doing the challenge in a spiderman suit) and The Mr puffing and panting behind a hillock looking triumphant. 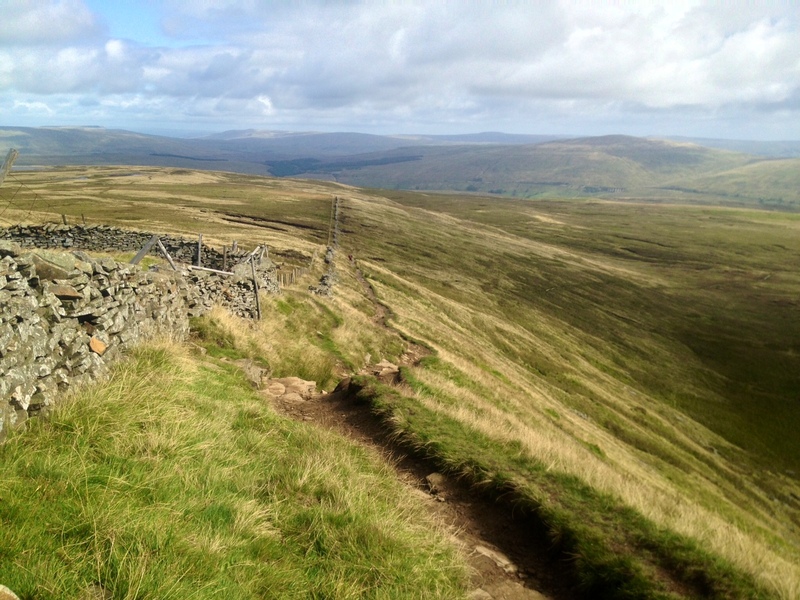 The next stage of the journey towards Whernside is one of the most distinctive parts of the route. Ribblehead viaduct is 440 yards long and has 24 high arches which tower 104 feet above the ground. It’s beautiful and a compelling landmark on the walk, standing as it does at about the halfway point. However, so many people died building it in the 1870s, Midland Railway paid to extend the village graveyard at Chapel-le-Dale and several of the graves are thought to be mass ones. There are remains of the navvies encampments still on the moor, showing where they lived and sometimes died. It’s not a very nice place to think of people living as it’s so bare and bleak. The wind whistles and there is no shelter except for a white house on the left of the path. This is Blea Moor Signal box and there’s no road up to it so every day the signalman has to walk over a mile to reach it. The path starts getting steeper after this point. The path is stone slabs about the size of a rough thick paving slab with about a 2 inch gap between each one. This is the most difficult part of the walk, simply because it’s so dull. The hill drags on and on for two miles. We were lucky that we had views on the left of a lake and the hills but often it’s cloudy or misty and all you can see is the next grey slab in front of you. After the slabs stop, the path steepens – which isn’t much fun on legs tired from climbing - and then it’s a walk up to the trig point. There’s a tiny little gap in the stone to get through to it as the point is behind a dry stone wall. It would be a bit irritating if you climbed all the way to the top of this mountain to not get through the gap! However, the stone wall had been collapsed a bit further along so maybe an angry Sumo Wrestler enraged at his inability to get a photo of himself at the trig point had charged the wall enabling future generations of walkers – and wrestlers – to get the desired pic without having to resort to photoshop. It was nice to get to be at the top of Whernside as this meant that we were now past the halfway point! And I still had pick’n’mix left! 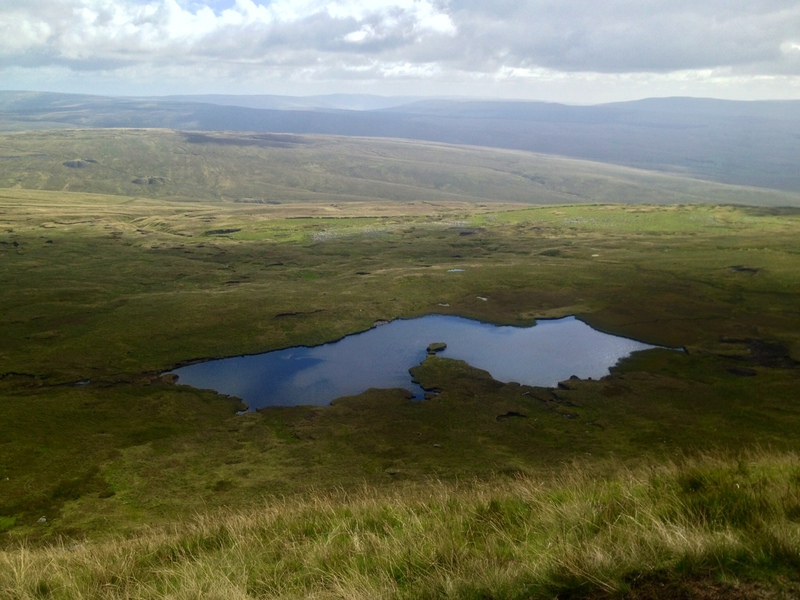 We still had plenty of water left in the water bladders and I didn’t think I’d need a refill as there’s only a short walk from Whernside to Ingleborough. We ran a short section of the descent but soon the side steepened so dramatically we were walking, then picking our way down carefully. In fact, this was the slowest part of the day. Slower even than the ascents. My toes were getting sore from the descents as the constant downhills meant my toes were hitting the end of the toeboxes. I tightened my shoes to try and combat this but didn’t hold out much hope for my toenails. I wouldn’t take a bet on how many toenails I’ll start next week with. 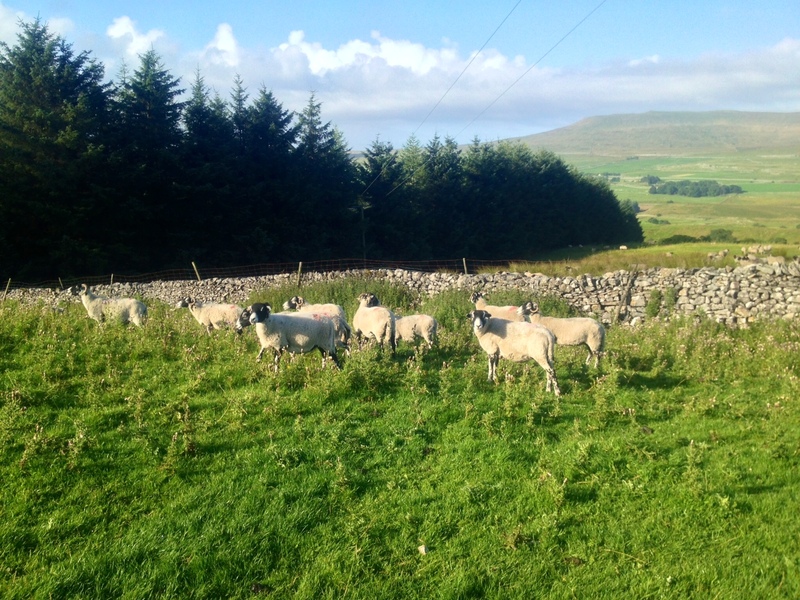 There is a farmhouse stop between Whernside and Ingleborough – The Philpin farm. There are loos available to customers and a selection of emergency items ... dry socks, shoelaces and ice cream! Surely EVERY day is an emergency ice cream day? Despite this, we didn’t stop. Despite the people eating their ice creams and looking happy with their non-sore toes and their cold drinks. Smug gits. 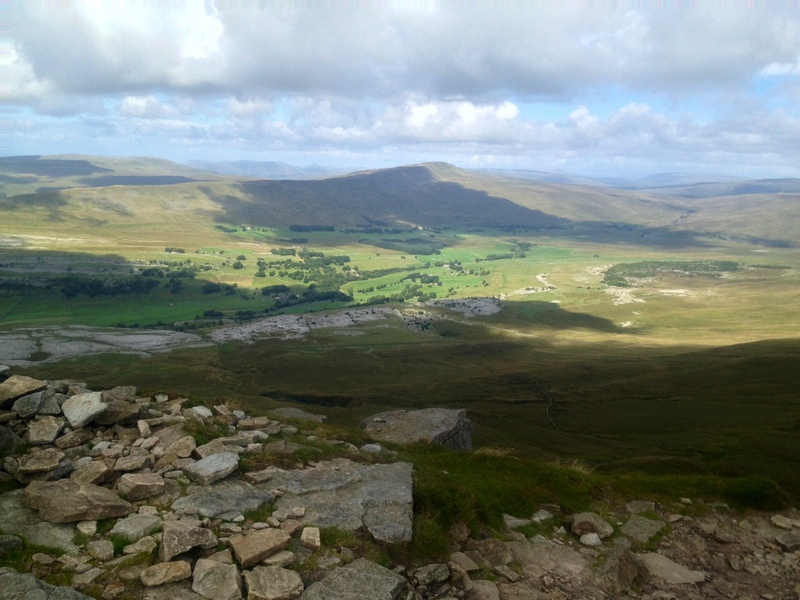 The third mountain, Ingleborough is sharp, steep and long. On my previous Yorkshire 3 Peaks challenge, the mountain had inadvertently been christened “FuckFuck” mountain. It’s the final peak and you look up ... and up ... and up. And then you see the people crawling up the side of the mountain like insects. Then you say its name. This time climbing it, there wasn’t much water coming down the side of the trail. Previously, I’d climbed it in a rainy October and the water had been running down the cliffs so you were climbing in a small chilly mountain stream. It was windy today but the visibility was brilliant and you could see the viaduct in the distance, small and perfect like a bridge in a model railway. It looked as though you’d be able to reach out and pick it up. I couldn't tell where the trig point was so aimed for the biggest group of people assuming that this would be where the trig point was. Nope. I accidentally interrupted a picnic. They didn’t even offer me a sandwich. Finally found the trig point and had the obligatory photo. This was the final mountaintop of the day ... unless things go horribly wrong or I realise I’ve left my mobile phone at the top of the last mountain and have to go back and retrieve it. Looking down the side of the mountain, I could see the trail winding down the hills below like a sinuous snake. Can I just emphasise that ... DOWN the hills. All downhill. Brilliant. And there was now only about 5 or 6 miles between me and a massive fry up. And an ice cream. I reckoned I could RUN that distance within an hour. Especially with those incentives. I looked at The Mr. He gave me a filthy look and told me his feet hurt and there was no way he was running 6 miles. I suggested a bacon sandwich. He sighed and started running. The path down alternated between smooth dirt and gravel, broken stones and steep edges and limestone boulders. The surface could be aurally determined by the girlie screams behind me as The Mr tripped over stones and trod on pointy rocks. Eventually things came to a head. He shouted in a grumpy voice that he wasn’t going to run ANY MORE and it didn’t matter how many bacon sandwiches there were. We compromised and walked quickly. Well I walked quickly. He shambled. And shuffled. Just as we were walking down one of the last hills, we were overtaken by a middle aged couple with coordinated anoraks, bobble hats and those alpine sticks. They seemed a nice couple. If slightly matching in a there-are-bodies-under-the-patio kind of a way. I looked at The Mr and mouthed “Bacon Sandwich.” He looked back and sighed and broke into a shuffling run, the kind of run any zombie would be proud of. Good. No matching anoraks any time soon then. We made it back to the cafe and checked in at exactly 8 hours from when we started. We bought a bucket of coffee each and a selection of snacks which we dug into with the fervour of a couple of Donner party survivors confronted with non-human goodies. GOOD name!! I think Mountain #3 now has a more appropriate name!! It's nice that it's all downhill ... but it's not easy going is it? Toenails are still all attached - woo woo! - although they're not entirely 'normal' colours! I never fail to laugh at loud at your posts chick - this was no exception! I love the gazelle on rollerskates comment brilliant.